That’s the only logical explanation for this. Please excuse that orange car that got in the way. ‘16 R, 6MT, 11k miles. I’m in love. Corrado “Magnum” G60 shooting brake at C&C. Both belonged to a shop in my hometown in PA (and I believe the same guy that did that Harlequin cross country adventure recently), and I believe he sold one or both at $50k a piece. Saw this last week at Lehigh Valley C&C. Holy cow. Bought a torque wrench and installed them this afternoon. Neuspeed RSe52 18s in satin bronze. A bit of weight saving (20.75lbs a piece) and a switch from the hyper silver peeler reps that’ll be on winter duty. Can’t wait to break in the Ventus V12s, as they are my first set of summer tires. 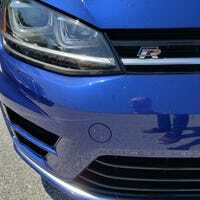 VWR Springs with Koni Yellows. Now just need to get around to putting the summer wheels and tires on. Why wouldn’t it be on the sidewalk? Should have gone to Lucky’s. Set the crossbars and bike rack up on the GTI tonight, with a quick jaunt to Target to make sure everything was secure. Obligatory nighttime potato picture. I’m still planning on the MK8 Golf R to be my next car, but that is a long way away, and I can’t keep off the car buying sites. If you had $40k for a DD with a relatively short commute, lets say 2010 or newer, what would you buy, and why? Simeone demo day photo for your time. Picked it up on Saturday. ‘87 GTI with a 2.0 16v from a newer mk2. Needs work, but it fires right up, pulls hard and isn’t thrashed. Getting it tagged when I get back from Chicago, super excited! So I’m sure this has been done to death, but it’s the first time I’VE done it, so I hope that’s cool. I bought a camera a couple weeks ago, just to have some fun with. I am no photographer, but I thought I’d post some shots from the local C&C in Chester County, PA. Went for a run the other day and came across this driveway. This guy gets it. Convertible PT Cruiser, wood vinyl siding, AND chrome fake fender vents. Possibly the classiest wheelchair-accessible van. Dem wheels. Dat sticker.